I wasn’t a big fan of Nights of Azure when it first came out. I liked some of the ideas behind it, and the art direction and character designs are fantastic, but I felt that clunky gameplay and poor storytelling held it back. In the years since, I’ve come to appreciate that game a lot more—thanks at last in part to a fascinating review from DigitallyDownloaded.net, and Arnice’s appearance in Warriors All Stars. 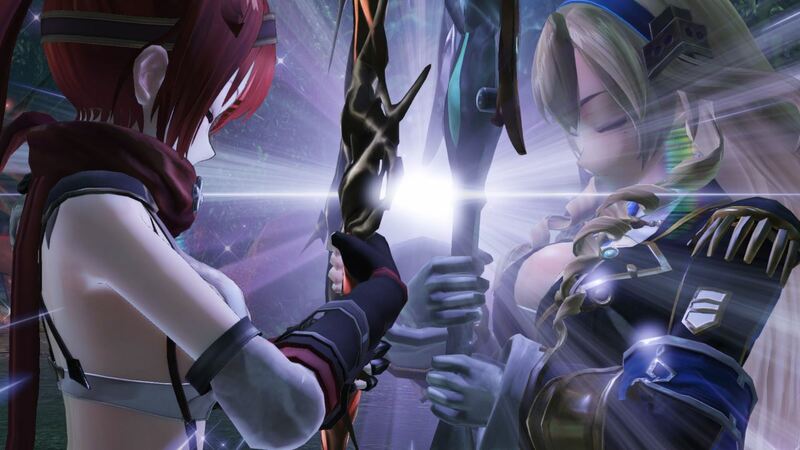 So despite my dislike of the original, I found myself looking forward to Nights of Azure 2: Bride of the New Moon. In a lot of ways, this is the game that Nights of Azure needed to be. I wasn’t alone in my criticism of the first game, and it’s clear that the game’s developers, Gust, paid a lot of attention to the common complaints. The combat system, often cited as being repetitive and bland, has been revamped to be a lot more captivating. The story is less convoluted and more tonally consistent, aided by a much better localisation effort. The supporting cast has far more personality than that of Nights of Azure. Meanwhile, Nights of Azure 2 retains (almost) all the things that worked well in the first game. The basic premise is very similar: in a world enveloped in endless night, a mysterious religious organisation known as the Curia uses ritual human sacrifices to delay the end of the world, and the player is tasked with reluctantly guiding the next sacrifice to her fate. 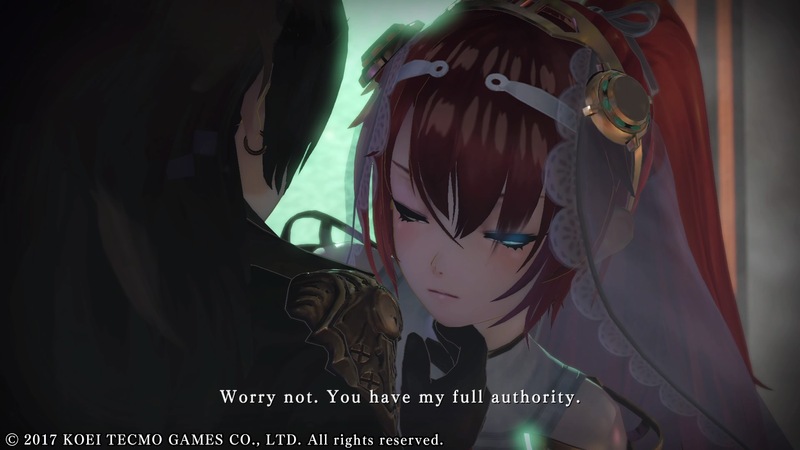 Nights of Azure‘s lesbian themes are as present as ever, and the story still a welcome subversion of common damsel in distress and holy sacrifice tropes. The art and world design still carries the same gothic style, riddled with melancholy beauty. The character designs are still phenomenal (although the new main character, Aluche, isn’t a patch on Arnice). By fixing what was broken and leaving well alone the things that weren’t, the folks at Gust have created a fantastic game in Nights of Azure 2. The relationship between Aluche and Liliana puts a twist on a tragic, timeless story. Much like its predecessor, the game opens with its heroes, Aluche and Liliana, in the midst of their journey. Liliana is the latest priestess to be chosen by the Curia for a recurring sacrifice to keep demons bent on world destruction at bay, and Aluche—Liliana’s lover and childhood friend—is the knight tasked with escorting and protecting her. Like Arnice and Lilysse of Nights of Azure, the relationship between Aluche and Liliana puts a twist on a tragic, timeless story. This isn’t Yuna and Tidus or Setsuna and Endir; Aluche and Liliana aren’t distant stars brought together by chance or fate. They’ve known and loved each other forever, giving the story a particularly sorrowful direction. Moreover, the fact that they’re both women directly subverts the sexist underpinnings of the “holy sacrifice” narrative: instead of presenting women as inherently tied to sacrifice while men get to be tragic heroes, it becomes a story about a broken system and the women within it—be she a priest or a knight—fighting to break free. Nights of Azure 2 adds another layer with Ruenheid, a sort of third protagonist who’s also a childhood friend of Aluche and Liliana. She’s part of an organisation called Lourdes that’s somewhat at odds with the Curia; Lourdes also want to stop the demonic threat, but they believe that the ritual sacrifices won’t achieve that, and that they actually feed the demons’ power. Despite their different perspectives and even their different methods, their goal is the same—stop the demons from destroying the world—and so they find themselves working together. To complicate things further, Aluche dies in the game’s opening moments, only to be resurrected as a half-demon, a species that Rue has a deep-seated hatred for. The juxtaposition of long-held friendships, complex romantic feelings, and competing ideologies creates a framework for plenty of character drama. There are moments of brevity, but unlike the first game, Nights of Azure 2 is much better at shifting between mournful, sweet, and humorous moments without undermining the sombre tone that’s a constant piece of the backdrop. The characters themselves are a fantastic bunch, generally speaking. I’m not as sold on Aluche; compared to Arnice’s quiet stoicism and sympathy, Aluche comes across as hotheaded and even juvenile. This is made up for by a strong supporting cast, from the conflicted Rue to the brooding assassin Verushka. 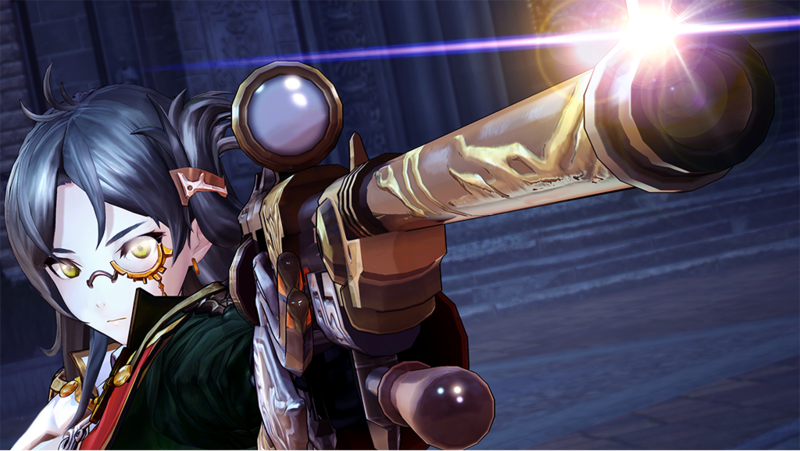 My favourite is Camilla, a rifle-wielding mad scientist responsible for Aluche’s rebirth, whose desire to experiment is frequently at odds with her own caring nature and ethical philosophy. In Nights of Azure, the secondary characters often felt superficial, but in Nights of Azure 2 they’re far more fleshed out and relatable. Part of that is thanks to the fact that Aluche can bring friends along on her adventures. In the previous game, Arnice fought alone, save for monster minions (called Servans) that could be summoned to fight for short periods of time. Nights of Azure 2 adopts a more traditional JRPG party system, where Aluche is joined by one companion of your choosing and two Servans. Mid-combat dialogue exchanges, partner attacks, and each character’s unique fighting style all help to build up their personalities beyond just what you get from cutscenes. 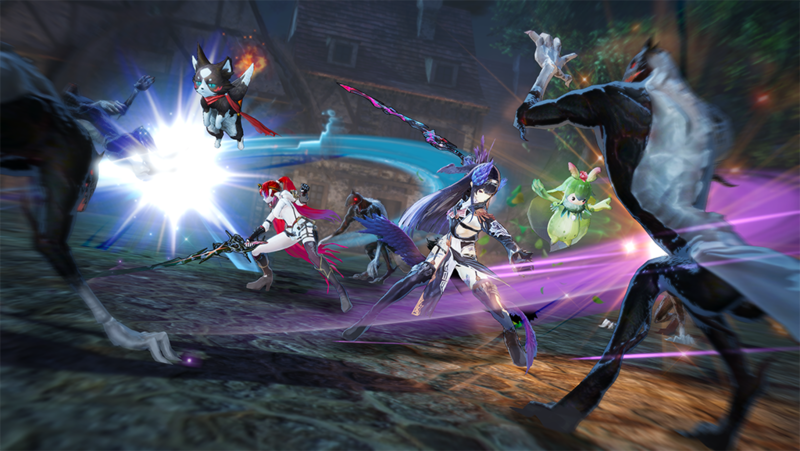 They also make the combat itself far more dynamic and varied, addressing one the most common complaints about Nights of Azure. It’s still a hack-and-slash game, and Aluche is the only character you can directly control, but the different supporting characters do encourage slightly different styles of play. They each have a special move that they can use relatively often to buff the party or afflict enemies with status effects, and two different super moves that are charged in different ways. Servans also work differently this time around, in that they simply follow you around whenever you’re out in the field rather than needing to be summoned. They fight of their own accord, mostly just adding a little bit of extra damage to nearby enemies, but each one also has a special move that you can activate at will (at the cost of MP). The effects of these vary greatly, from simple elemental attacks to healing spells to transforming Aluche’s weapon. Finally, the level design is far more creative this time around, aiding the sense of exploration and making boss fights in particular much more interesting. There are often environmental hazards that you can use to your advantage, like oil barrels that you can spill and set alight to create traps. Maps have more things to see and find, and areas gated by Servan abilities encourage you to revisit places once you’re further into the game. It might seem odd, then, that the game is governed by a time limit. Each time you venture out from the safety of Hotel Eterna (your base of operations), you have a set time to explore before you’re forced to return—initially it’s 10 minutes, but that limit increases as you level up and progress through the game. After each endeavour, you have to sleep, progressing the in-game calendar by a day and bringing the world closer to destruction, as indicated by the phase of the moon. Once you hit a new moon, it’s game over—although you can delay this by completing main story objectives. This creates an odd dynamic where’s a constant pressure to keep pushing forward, despite all the treasures to find and sidequests to complete. 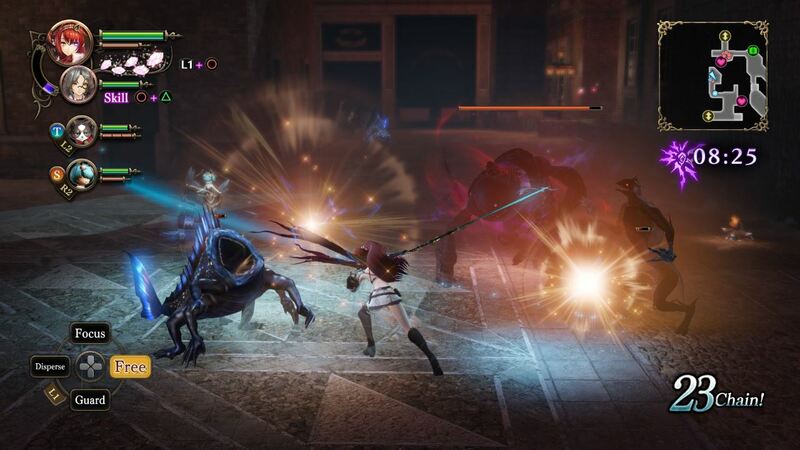 It’s not so strict as to force you to abandon optional objectives unless you really mess up—there’s plenty of time to do everything—but it does at least create a sense of urgency that’s often missing from JRPGs. Like I said before, this game feels it’s what Nights of Azure wanted to be. It’s got the same fascinating ideas and beautiful gothic art at its core, but more involved game systems and stronger writing help those ideas flourish. Koei Tecmo’s had an incredibly good year, and Nights of Azure 2: Bride if the New Moon is the perfect conclusion to that. If you enjoyed this review and plan to buy Nights of Azure 2, you can support Shindig by shopping with this Amazon affiliate link. Nights of Azure 2: Bride of the New Moon is developed and published by Koei Tecmo. It’s available now for PlayStation 4 (reviewed) and PC.